It has been 10 years since Pixar’s animated hit “Finding Nemo” splashed into theaters and everyone fell in love with a clown fish named Marlin and his forgetful blue tang fish travel companion, Dory, in a quest to find his son, Nemo. This week, Pixar announced a sequel, “Finding Dory,” will swim into theaters on Nov. 25, 2015. Marlin and Nemo will return along with the Tank Gang and several of the original characters from the first film, but some new characters will be introduced. In the first film, many fans wondered why Dory swam alone as she bumps into Marlin in his search to find his son. Now that Nemo is safely home with his father and his newfound friends, the group abandon the Australian waters and set out to the sunny California shores to find Dory’s family. If “Finding Dory” is as successful as its successor, “Dory” will be in great shape. “Nemo” is the third-highest grossing animated film and won the Academy Award for Best Animated Feature. Since its release, the film has sold over 40 million copies and was the highest grossing G-rated film before Pixar’s own “Toy Story 3” overtook it. I, for one, cannot wait for the film to hit theaters. I enjoyed the original as much now as I did when I used my niece and nephew as an excuse to watch it in theaters when it first was released. 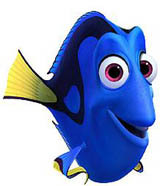 And, of course, everyone’s favorite character was Dory to begin with.